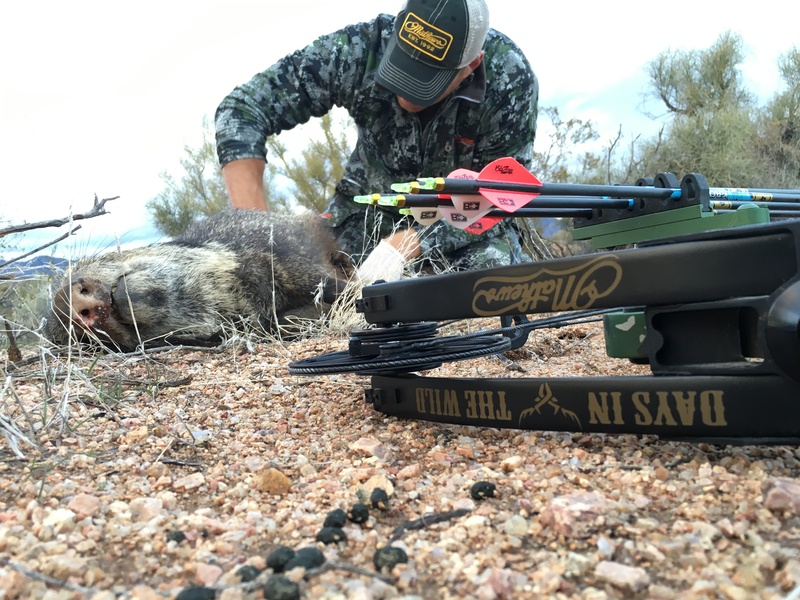 Javelina Hunting In Arizona Can be some of the most fun spot and stalk hunting in the country and it can also be a exercise in futility. Javelina although plentiful throughout Arizona can be very tough to find. Javelina Hunting In Arizona should begin with locating good Javelina habitat, much like deer and most other desert dwelling game species, Javelina need food, cover, and water. Concentrating your efforts around permanent water sources, thick bedding cover, and hill sides with succulents and tubers will prove to hold more javelina. Look for vantage points the will offer you a good view of the habitat that javelina occupy. I don't hunt Arizona desert without 15x56 swarovski binoculars mounted on a tripod i would suggest buy the best optic you can afford and get a good solid tripod to give you a super stable platform to glass from. Slowly and methodically pick the hill side apart looking for the outline of what could possibly be a javelina. Often the grass is tall and they are low to the ground so it can be very difficult to spot them, so if you see something that looks like a javelina stare at it long enough it may start moving and confirm your suspicion. Once you have found a herd of Javelina watch how they are feeding and in which direction they are feeding to. Choose a line to stalk that intersects where they are going to and keeps you down wind of them. Javelina don't have great eyesight and they often make a lot of noise which can help mask your noise. However, they have excellent noses and don't have much tolerance for human scent if they catch a whiff they are usually gone! make your approach swift until you get to the 150 yard mark and they slowly and quietly begin slipping in,constantly stopping and glassing your approach. Often there will be javelina scattered across the hill side that you did not see originally. once you have spotted them close the distance to your comfort zone and wait util your shot presents itself. 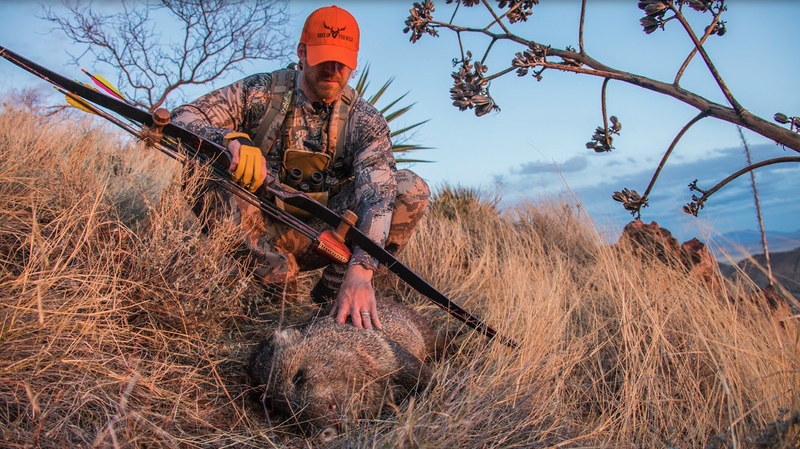 If your stalk is blown often the Javelina will begin to make a "woofing" sound and they run off, you may be able to "woof" back at them to get them to stop running and make a shot. Often woofing can even call other that weren't close when you got busted to come in your direction. Predator calls or javelina in distress calls work well in this situation as well. Javelina are very herd-centric animals so they will often come to the rescue of one of their own in trouble. after you have blow them out begin whaling on your distress call 6 out of 10 times they may come back running in for a fight . 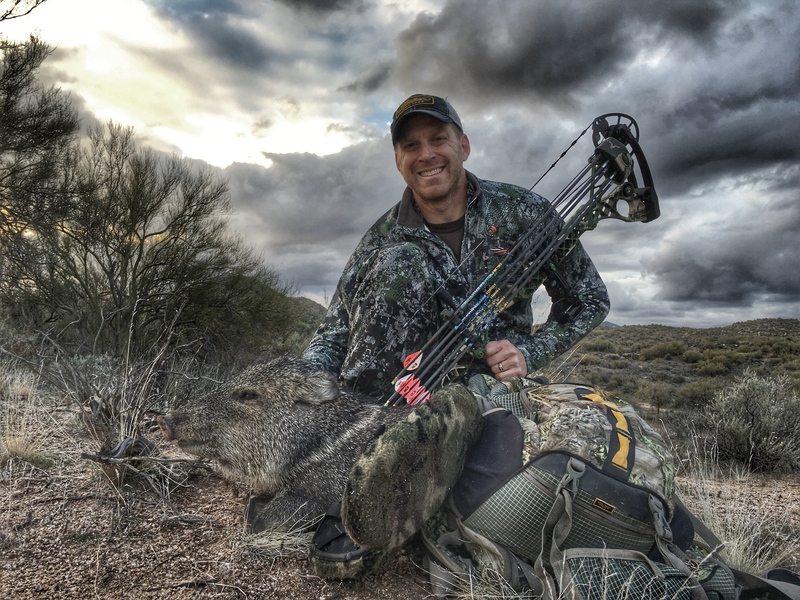 Javelina Hunting In Arizona with Days in The Wild Outfitters offers Javelina hunts in all three seasons Archery, Hand Gun/Archery/Muzzle loader (HAM hunt) and Rifle seasons. Our hunts are typically 3 day guided only or Fully Outfitted Hunts but we can add days if needed. We have 100% shot opportunity on these hunts in all seasons. We specialize in tradition archery hunts slipping our clients often within 10 yards of their target. a 3 day spot and stalk guided only hunt is $1200 and Fully outfitted is $1900. Tag are easy to draw and every year there are left over tags that are first come first served in the units we hunt.